There are certain unwritten, but undeniably non-negotiable and obligatory rules that must be abided by when attending a heavy metal concert. Rule # 1 is you must wear a leather jacket. Rule # 2 is that you must wear an old ripped up Iron Maiden tank top in case it gets too hot. Rule # 3 is you must have a tape of the band to crank in the parking lot before and after the show. Rule # 4 is that you have to sneak something into the show, i.e. cameras, booze, other items. Rule # 5 is that in order to have a really good time, you must stay out of jail . Rule # 6 is that you must scream until your voice is hoarse in the morning. Rule # 7 is that you have to bang your head until your neck is sore the next day. Rule # 8 it is pertinent that (even if you don't smoke) you must have a bic lighter to light up during the slow songs. Rule # 9 is to know your limits, puking isn't much fun. Rule # 10 is to remember that, in the immortal words of Zeppelin, "Now is the time, the time is now." This review is for everybody who spent their days at school busy drawing the logos of all the bands they listen to. My mom would get me a stack of new PeeChee folders every year and I used to cover them with these perfectly hand-drawn band logos like Led Zeppelin's and the Scorpions'. Old memories that come back so fresh into the mind, when there was no room left to draw on those subject folders, I would draw a few Motley Crue and Iron Maiden logos on the bathroom walls. Now, I'm thirty-four, going on seventeen, and still a powerslave to rock and roll. I saw the Grateful Dead one hundred and sixty-nine times and the Jerry Garcia Band around eighty times. I've seen Tom Petty, Neil Young, Bob Dylan, and Phish around twenty times each. I saw Widespread Panic and String Cheese Incident about fifteen times each and I've seen Iron Maiden (my favorite band?) ten times, or close to. I've seen Aerosmith, Crosby, Stills, Nash and (at least 3 with Young), Pearl Jam, The Allman Brothers, Metallica, and the Rolling Stones about five, or six times each. I saw Linkin Park, The Other Ones, David Nelson Band, Hot Tuna, Bonnie Raitt, and Santana four times each. I've seen Sheryl Crow, Scorpions, Blues Traveler, Rush, Jackson Browne, Counting Crows, Incubus, and the Who three times. I've seen Ozzy Osbourne, Tesla, 311, Marilyn Manson, Stevie Nicks, ZZ Top, and the Dave Matthews Band twice. I've seen close to a hundred other bands at least once, and probably have completely forgotten to mention about a hundred shows. My favorite thing to do as a pastime is to see live music, that's why I made it my life's work to bring the concert experience to the reader. 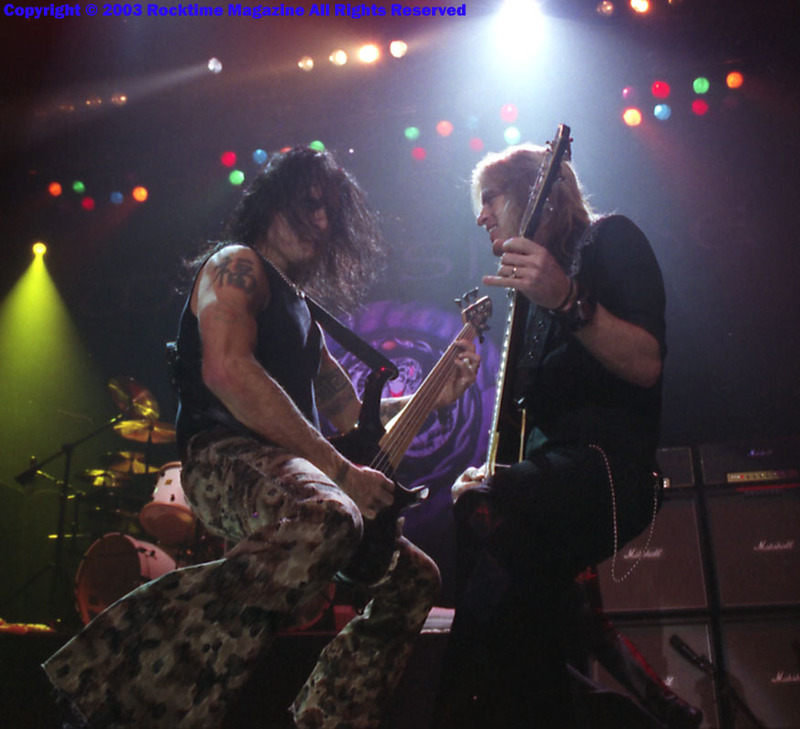 I saw Scorpions and Whitesnake both one time during the eighties when Rock was just freshly dead (like it is today?) and heavy metal was king. All I can say is that I won't wait sixteen and eighteen years to see either of these bands again. 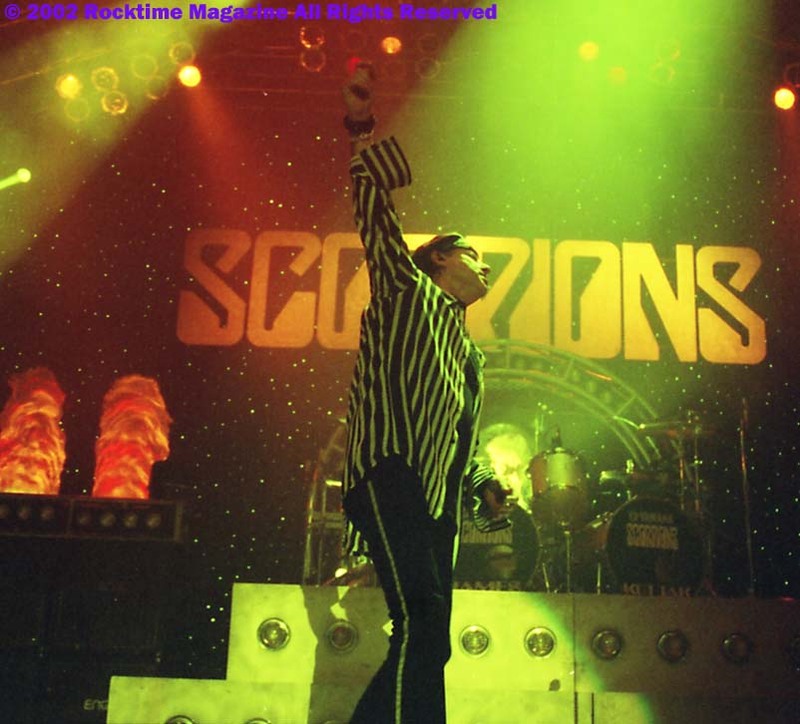 By the time I was really in love with the Scorps and Maiden, bands that broke ground in music like Metallica and Gun's and Roses were already making some real noise on the California scene. That was soon drowned out by the sound of grunge drifting down from the north and taking over the nation. The Grateful Dead drew the masses and took over the early half of the nineties and Phish ruled the concert entertainment industry through the latter part of the nineties. The Rolling Stones, Kiss, the Eagles, and the Who have returned to the scene to dominate concert revenues for the last five years. This tells us that all things that have passed will come full circle and will come to pass again. This last year found us amidst a heavy metal revival as many metal bands of yesteryear have risen again. Some never stopped, some had many member lineup changes over the years, but, these bands all still have faithful fans from coast to coast on every continent on the planet. Me being a red-blooded American boy raised on heavy metal, leather, studs, spikes, and the motto, "If it's too loud, you're too old," feels that this resurgence of the metal world on today's culture is just what the doctor ordered. 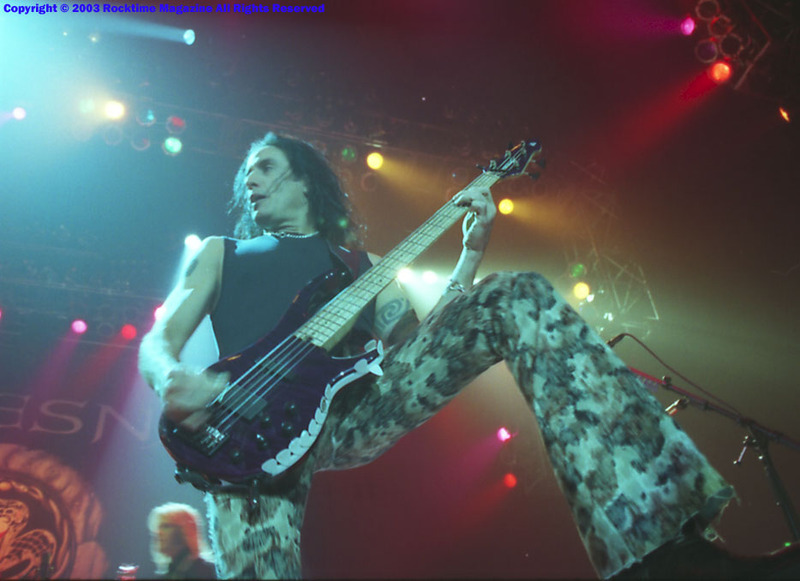 Without Iron Maiden, we wouldn't have Sum 41, without Scorpions we wouldn't have had Alice In Chains. Music inspires music and so the great story unfolds, the day Tom Petty met one Elvis Presley... the world was changed forever. The weather outside was cold and wet as lightning was bolting out of ominous dark clouds all around ARCO Arena. The weather seemed to be kept at bay just above the venue. Dokken opened up the show right on time at 7:00 p.m. The crowd was really pumped up for a wednesday night in the capital city. The venue was nearly sold out at half capacity, the upper levels were sealed off and curtains pulled back making ARCO Arena look smaller than it is. Dokken was great for an opener, they got the crowd primed for a couple of real premiere bands. Dokken can play all their best songs in thirty minutes and then their appeal is gone. They sound good still, but I didn't spend my money to see them in the eighties and wouldn't take the time to go see them in the new millennium either, but it's ok for nostalgia. Don Dokken opened his set with "Into the Fire," "Breaking the Chains," and "Alone Again Without You." After that, nothing worth mentioning. 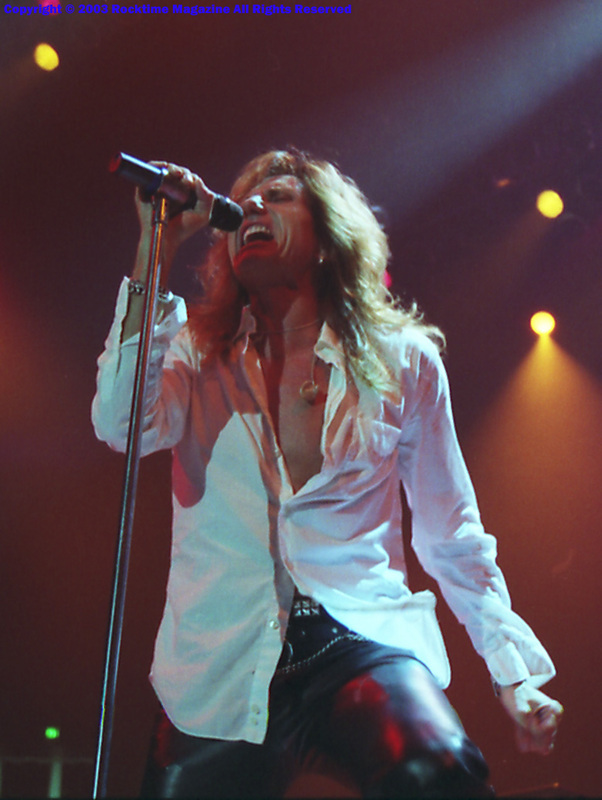 Whitesnake has one of the best lead singers in the business, and David Coverdale is still strutting his stuff in rare forum. Coverdale starts speaking after the first two songs, and he says he lives in Tahoe to the crowd and everybody went nuts. Throughout the show he kept on saying things like, "We're neighbors," and "Even my dentist is 'ere at the show." He must have been spending some time in northern California in recent years, his last solo album from 2000 has organ work by Mike Finnagan, who is a notorious California keys man who often plays with bay area local Bonnie Raitt. 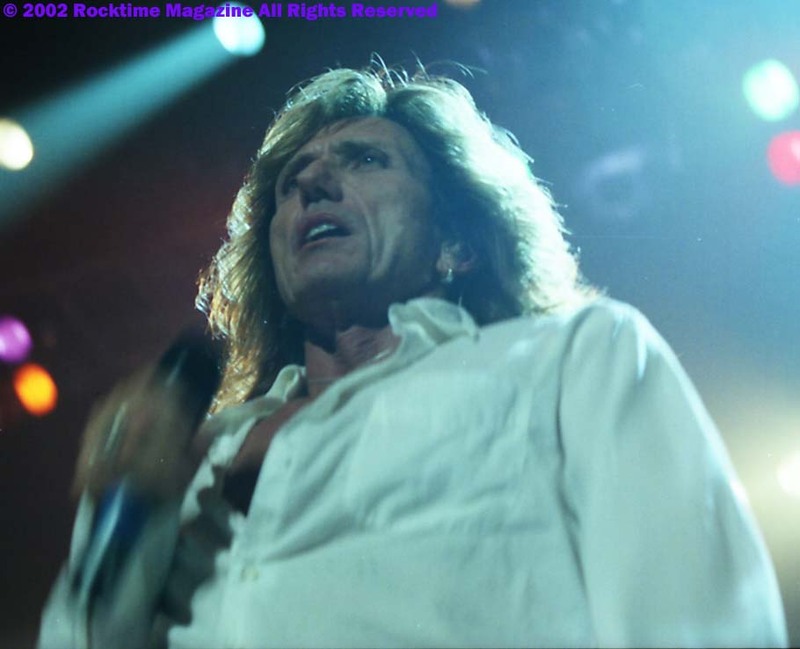 Whitesnake opened their set with "Bad Boys," "Slide It In," "Love Ain't No Stranger," and "Slow 'An Easy." I didn't recognize the fifth song, and it didn't have the umph of their better tunes. 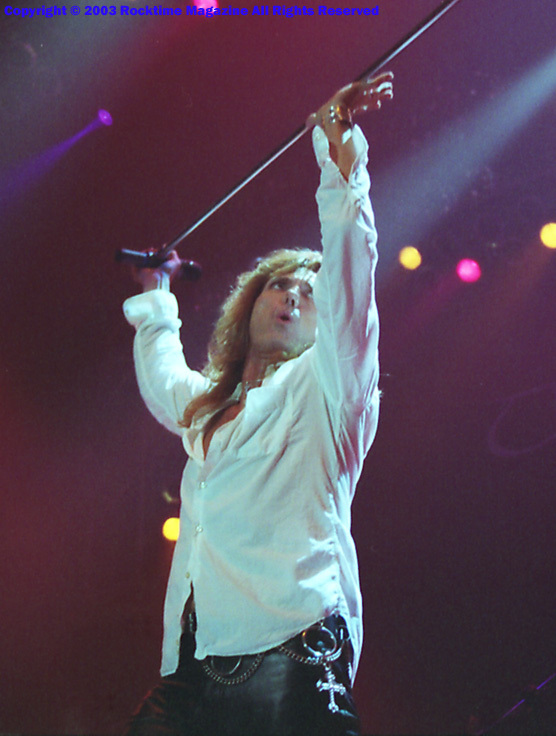 "Crying In The Rain," was fantastic and certainly one of of my fav's, but Coverdale has changed it a little bit to save his voice these days. He doesn't even try to hit the high notes that he used to hit on this song. The crowd was all in sync when the band busted out "Give Me All Of Your Love," and everybody was singing the words and they sounded pretty good. David introduced the band, which included a keyboard player that graduated jesuit high school right here in Sacramento, Timothy Drury, who has also played with the Eagles and Don Henley. 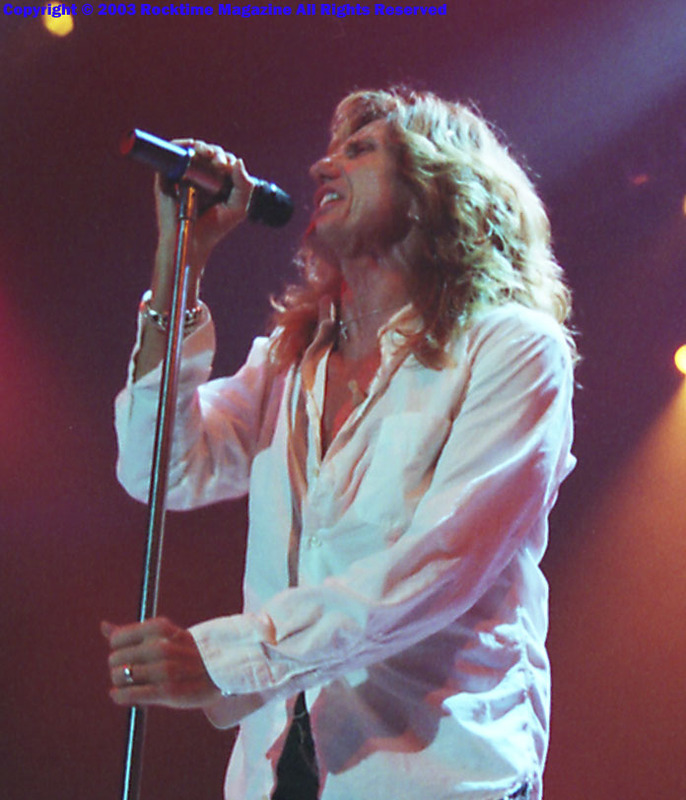 Coverdale put together a supergroup to do this tour and they sounded great. Rounding up a bunch of musicians that have all worked in two or three popular metal bands over the years. People like, Ozzy's drummer (Tommy Aldridge) and Dio's guitarist Doug Aldridge, a nice sampling of heavy metal heavyweights. It was Doug's birthday and David told everybody all about it. The vibe was awesome and I think there was some major partying going on backstage to celebrate the birthday. "Here I Go Again," Whitesnake's power ballad was next and the women were enthralled, this tune got every girl hot and wet when they first saw this video. I was disappointed to not hear the same highs in vocal range during this song too. At the end of this tune on the album, David Coverdale hits notes that are like supersonic man, well no matter, I've got the CD at home. I think this is when they did "Is This Love?," and everybody lit up their bic lighters and it got real quiet as they went into the slow intro. I love it when this song starts to speed up a little and then Coverdale lets it rip. 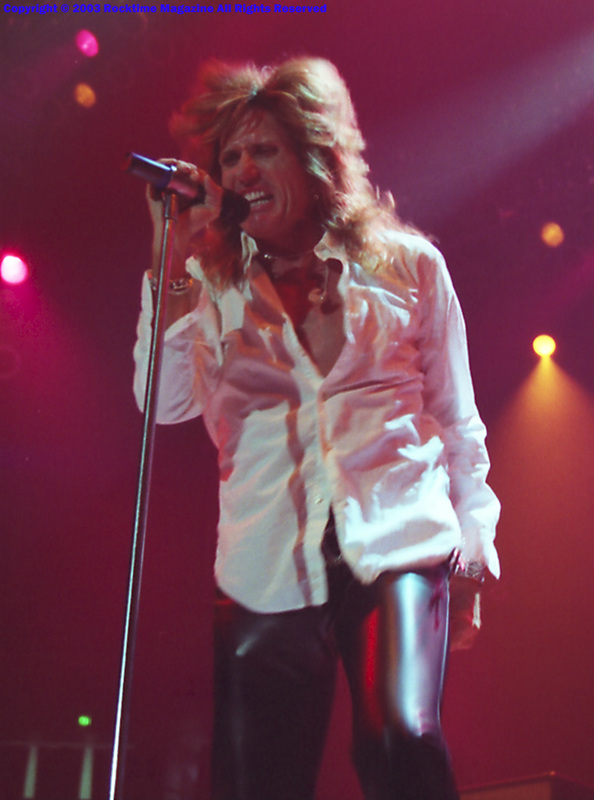 The high point for the Whitesnake set was definitely their last and best song "Still of the Night," in which David hit every note perfect and didn't pussyfoot around the highest notes at all. A stellar performance from a supergroup. The Scorps were absolutely unbelievable. 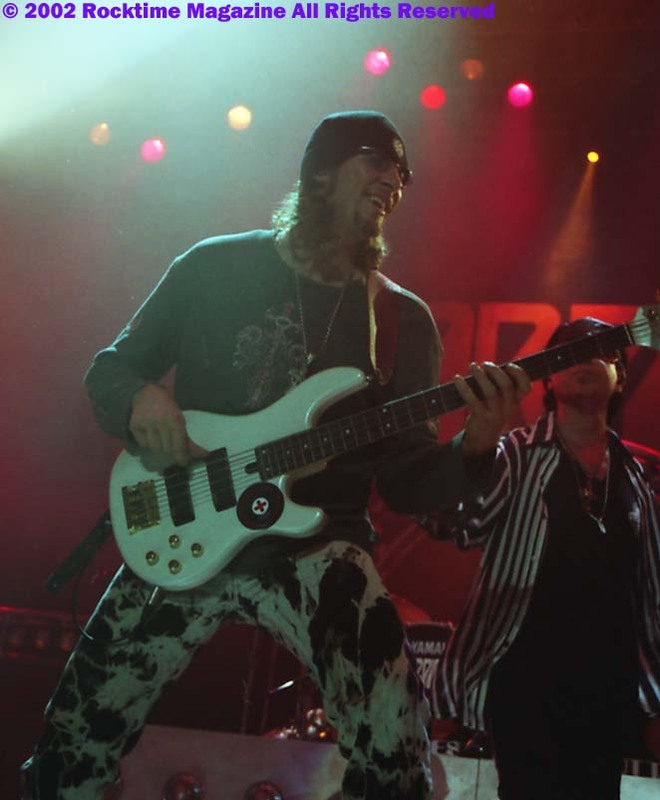 They started to walk on stage really slow and then Klaus Meine came running onto the stage blazing past Rudolf Schenker and the whole band exploded into action. Nine foot tall flames blasting off on either side of the stage and the stage lights all lit up. 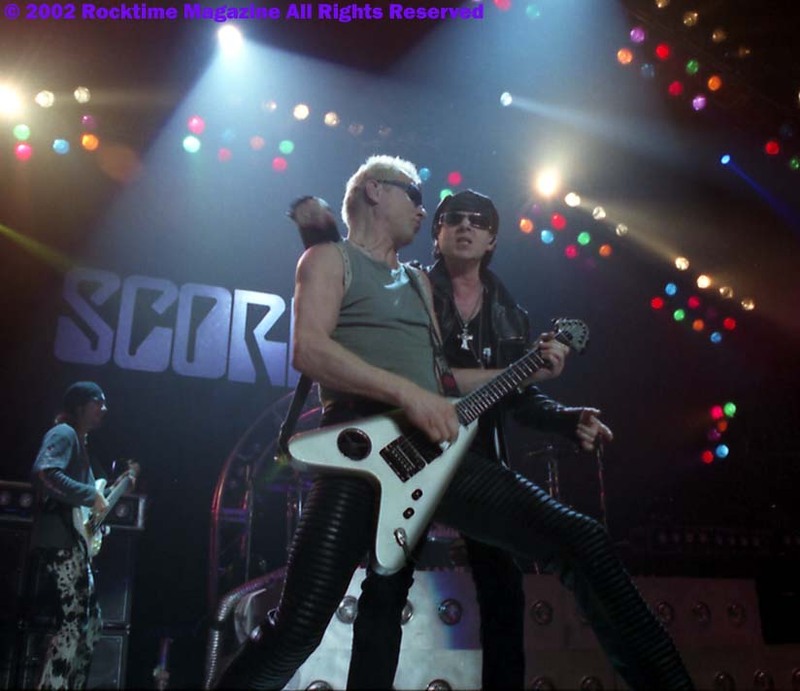 Scorpions opened the show with the same opener they used all summer long last year, "Coming Home." They skipped "Bad Boys Running Wild" and went right into "The Zoo." 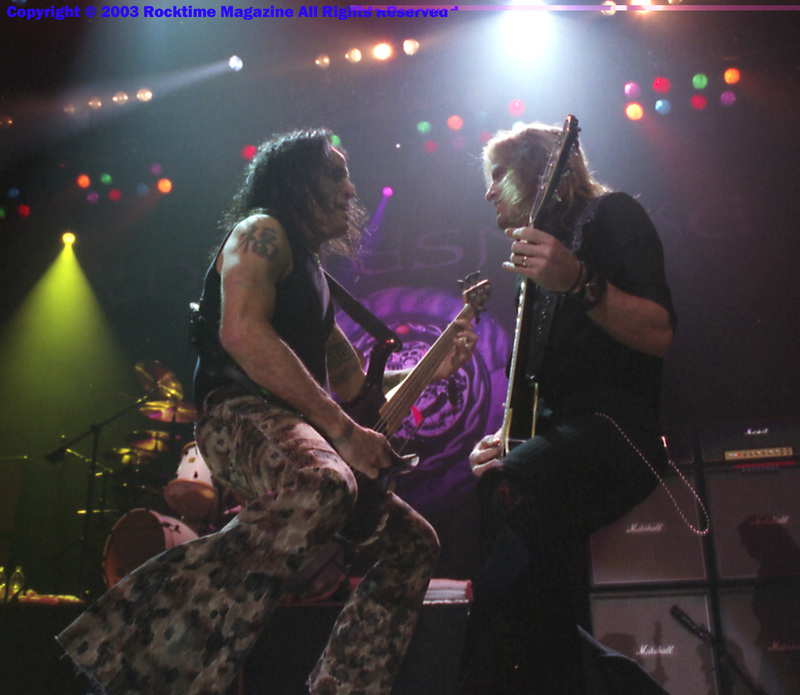 The slow grind came up so perfectly as the lights dimmed to create the ultimate mood for rocking. Klaus was banging on a cowbell and throwing out drumsticks. They were nice sticks, but they didn't have the Scorpions logo on them. I was lucky enough to grab one out of the air just before three people in the front row were going to catch it at the same time. 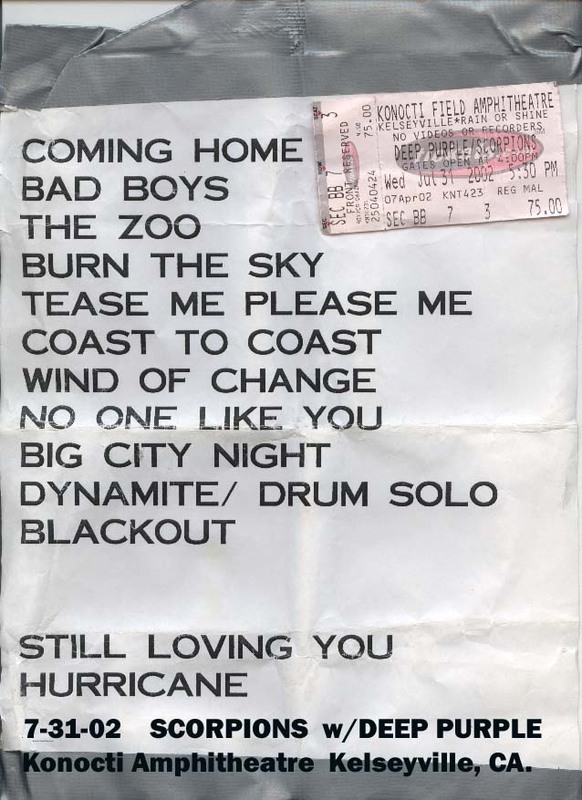 The third song was "Burn the Sky" and then the set list went crazy killer. 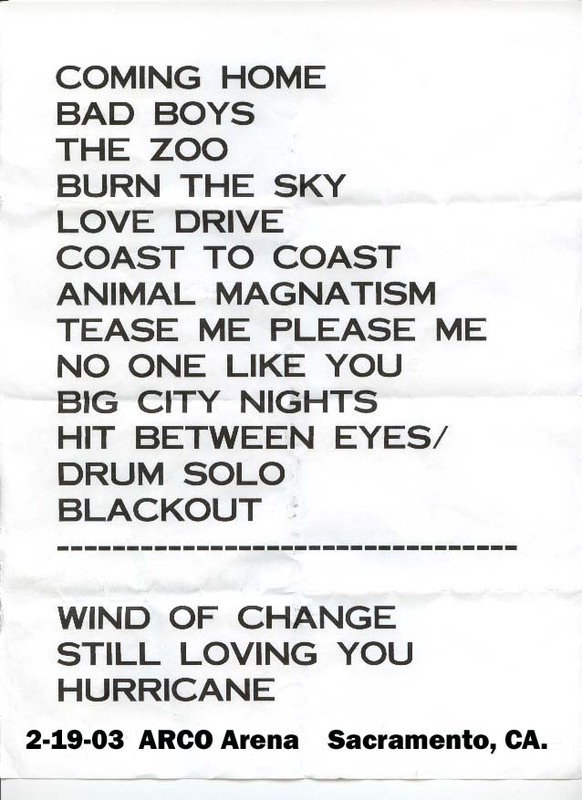 They added songs that they didn't play this last summer, they slipped in "Lovedrive," which was one of the songs I had hoped they would play. A great song from a great album, really rounding out their set list. Of course they didn't go way back and play anything from "In Trance," that would have blown my mind. "Coast to Coast," a song that shares the love affair with the guitar; Klaus even plays guitar on this one as there are no words for him to sing, the piece is completely instrumental. Next, another addition to this year's steeliest "Animal Magnetism." I could have done without this one and would have been quite pleased with "Now," "Arizona," or "In Trance" instead. But still, the song is awesome and I was glad to hear the steeliest had changed slightly for the better. Things got cheesy right the and there as the Scorps pulled out that wimpy stuff made during the end of the poser era, "Tease Me, Please Me." Thank god grunge stepped in and saved us all from the attack of the ratted hair monsters. This song needs to be removed from the set list as well and replaced with something that really rocks like "Can't Get Enough." Klaus' voice sounds just like it did way back in the day, but maybe he doesn't sing this number anymore because of it's sheer intensity in the vocal department. After the worst part of the show, no (just kidding), it was all good. Klaus came to the middle of the stage and asks the crowd to sing with him and he started singing "Holiday." After he sang a couple of lines he stopped and motioned for the crowd to finish up the rest of the line. The crowd came through in flying colors right on key, but the band had other plans for them as they went right into "There's No One Like You," a mandatory song at every Scorpions concert. That was followed by a crowd pleaser as they went wild during "Big City Nights" and then "Hit Between The Eyes." 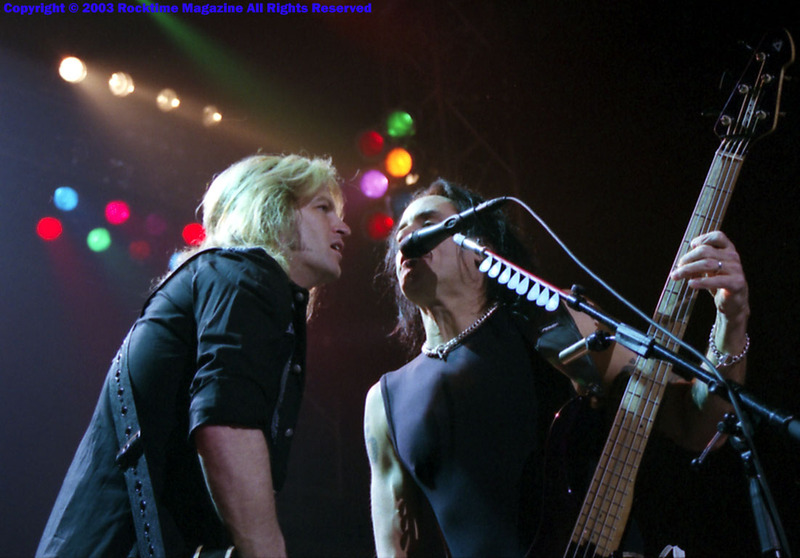 The ultimate Scorpions set wouldn't have either of these tunes, in my opinion, but still loved by all. The drum solo was short, but sweet, and in the middle of the cymbal shredding James Kottak rips off his shirt and puts on a #10 Mike Bibby Sacramento Kings jersey and the biggest roar of the night came from the 8,000 plus crowd. Apparently, the band was a fan of the Kings too and the crowd of cowbell town loved it. I had bumped into Scott Pollard earlier in the backstage area, quite exciting, he'll be back on the court this next week. This is the home of the Kings and Scott's a rocker, I wouldn't expect him to be anywhere else with the Scorps rocking his house. Klaus pulled out all the stops for "Blackout" just wailing on the old windpipes and pretty much blowing the roof off the joint. After a short break and some major screaming, they came back out for three more. 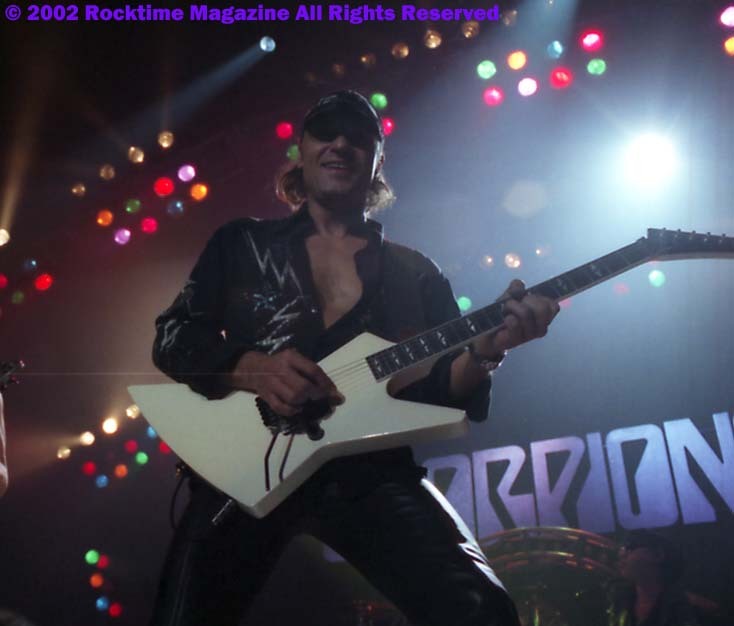 "Still Loving You," was one of the many highlights of the Scorpions set. 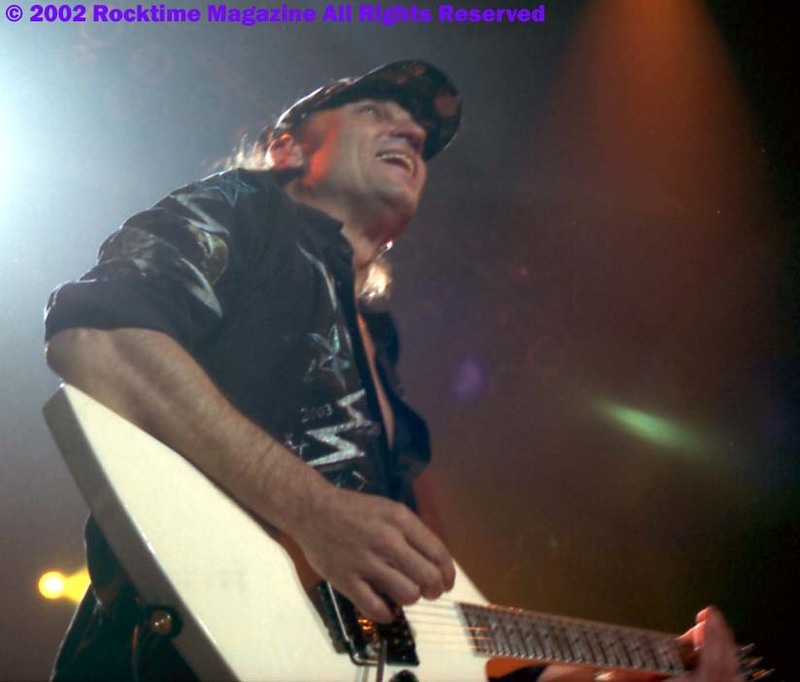 The only drawback to the set list changes was the dropping of "Dynamite," which is my all time favorite Scorpions song. Thanks for reading and we'll see ya at the shows. BOOKMARK IT!! BOOKMARK IT!! BOOKMARK IT!! You love it, or you live it.